Start off your visit on the 19th (Fri): enjoy the sand and surf at Burleigh Heads Beach, take in panoramic vistas at SkyPoint Climb, and then head outdoors with Pelican Feeding. On the next day, enjoy the sand and surf at Burleigh Head National Park, then kick back and relax at Coolangatta Beach, and then stroll through Kirra Beach. 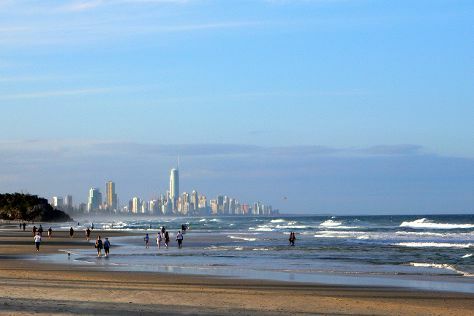 To find other places to visit, where to stay, ratings, and other tourist information, you can read our Gold Coast trip itinerary planner . Sydney to Gold Coast is an approximately 3.5-hour flight. You can also do a combination of flight and train; or drive. April in Gold Coast sees daily highs of 30°C and lows of 19°C at night. Finish your sightseeing early on the 20th (Sat) to allow enough time to drive to Mooloolaba. Start off your visit on the 21st (Sun): view the masterpieces at Atrium Gallery at Buderim Craft Cottage, then see some colorful creatures with a scuba or snorkeling tour, and then stroll through Mooloolaba Beach. To find photos, more things to do, ratings, and tourist information, read Mooloolaba tour planner. Traveling by car from Gold Coast to Mooloolaba takes 2 hours. Alternatively, you can take a bus; or do a combination of train and bus. April in Mooloolaba sees daily highs of 30°C and lows of 19°C at night. Wrap up your sightseeing on the 21st (Sun) early enough to travel to Airlie Beach. On the 22nd (Mon), explore the activities along Heart Reef, then take in the pleasant sights at Bicentennial Walkway, and then add some adventure to your tour with a kayaking and canoeing tour. For photos, maps, other places to visit, and more tourist information, you can read our Airlie Beach online sightseeing planner . Getting from Mooloolaba to Airlie Beach by combination of bus and flight takes about 5.5 hours. Other options: drive; or do a combination of train and bus. Plan for somewhat warmer nights when traveling from Mooloolaba in April since evenings lows in Airlie Beach dip to 26°C. Cap off your sightseeing on the 22nd (Mon) early enough to travel to Magnetic Island. On the 23rd (Tue), choose your vessel at Big Mama Sailing, stroll through Geoffrey Bay, and then explore and take pictures at Magnetic Island Forts Walk. To see other places to visit, where to stay, traveler tips, and tourist information, read our Magnetic Island trip planner . Traveling by combination of car and ferry from Airlie Beach to Magnetic Island takes 4.5 hours. Alternatively, you can do a combination of bus and ferry; or do a combination of bus, train, and ferry. While traveling from Airlie Beach, expect a bit warmer days and about the same nights in Magnetic Island, ranging from highs of 35°C to lows of 24°C. Finish your sightseeing early on the 23rd (Tue) to allow enough time to travel to Cairns. Kick off your visit on the 24th (Wed): take a memorable tour with Tours. Get ready for a full day of sightseeing on the next day: soar above the sights with a balloon tour and then enjoy the sand and surf at Trinity Beach. To see photos, traveler tips, reviews, and other tourist information, read Cairns trip itinerary builder website . You can do a combination of ferry and flight from Magnetic Island to Cairns in 4.5 hours. Other options are to do a combination of ferry and car; or do a combination of ferry and bus. In April, plan for daily highs up to 34°C, and evening lows to 26°C. Finish your sightseeing early on the 25th (Thu) so you can drive to Port Douglas. Start off your visit on the 26th (Fri): discover the deep blue sea with a scuba or snorkeling tour. Get ready for a full day of sightseeing on the next day: explore the striking landscape of Daintree National Park. To find other places to visit, traveler tips, and other tourist information, go to the Port Douglas online vacation maker . Getting from Cairns to Port Douglas by car takes about 1.5 hours. Other options: take a bus; or take a shuttle. In April, daytime highs in Port Douglas are 34°C, while nighttime lows are 25°C. Finish your sightseeing early on the 27th (Sat) so you can travel back home.